For quantitative determination of neuraminidase activity and screen for neuraminidase inhibitor. • Sensitive and accurate. Linear detection range at 37°C in 96-well plate: 0.1 to 10 U/L for colorimetric assays and 0.01 to 2 U/L for fluorimetric assays. • Simple and convenient. Homogeneous assay requiring only two absorbance measurements. Assay can be completed in 60 min. • High-throughput. Can be readily automated as a high-throughput 96-well plate assay to screen thousands of samples per day. NEURAMINDASE (also known as Sialidase) is an enzyme that hydrolyzes terminal sialic acid residues on poly-saccharide chains. It is predominantly expressed in microorganisms such as bacteria and viruses. Cleavage of sialic acid residues by neuraminidase is believed to play several roles in infection by influenza viruses. It is thought to assist in the penetration of mucosal linings, the invasion of target cells, the elution of progeny viruses from infected cells, and the prevention of self-aggregation. Thus, neuraminidase is an important target for influenza drug development and simple, direct and automation-ready procedures for measuring neuraminidase activity find wide applications in research and drug discovery. BioAssay Systems’ neuraminidase assay measures the sialic acid released by neuraminidase in one step. The change in color intensity of the reaction product at 570nm or fluorescence intensity at λex/em = 530/585nm is directly proportional to neuraminidase activity in the sample. 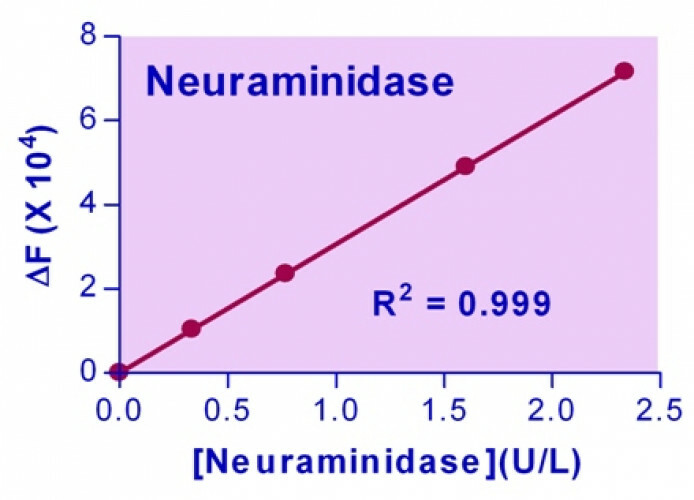 Applications For quantitative determination of neuraminidase activity and screen for neuraminidase inhibitor. References Assay: Neuraminidase in Yeast Purified Lysate. 2. Li, J., et al. (2013) CodY is a global regulator of virulence-associated properties for. Clostridium perfringens: 00770-13. Assay: Neuraminidase in C. perfringens Cells (Pubmed). 3. Subathra, M et al (2014). Evaluation of antibody response in mice against avian influenza A (H5N1) strain neuraminidase expressed in yeast Pichia pastoris. J Biosci. 39(3):443-51. Assay: Neuraminidase in Pichia pastoris cells (Pubmed). 4. Jihong L, et al (2014). The Sialidases of Clostridium perfringens Type D Strain CN3718 Differ in Their Properties and Sensitivities to Inhibitors. Appl Environ Microbiol. 80(5): 1701?1709. Assay: Neuraminidase in Clostridium perfringens cells (Pubmed). 5. Itoh, Y et al (2015). Emergence of H7N9 Influenza A Virus Resistant to Neuraminidase Inhibitors in Nonhuman Primates. Antimicrob Agents Chemotherapy. 59(8):4962-73". Assay: Fluid Samples in Macaque (Pubmed). 1. Subathra, M et al (2014). Evaluation of antibody response in mice against avian influenza A (H5N1) strain neuraminidase expressed in yeast Pichia pastoris. Journal of Biosciences: 1-9. Assay: Neuraminidase in Yeast Purified Lysate.